(CNN) -- France's Michel Desjoyeaux won the Vendee Globe solo round the world yacht race for a record second time on Sunday. Desjoyeaux crosses the line in triumph at Les Sables to win his second Vendee Globe. 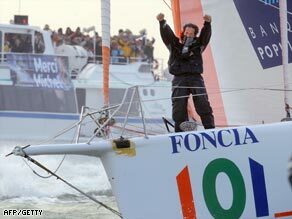 He crossed the line off Les Sables d'Olonne in a time of 84 days, three hours, nine minutes and eight seconds to smash the race record by over three days and claim a 150,000 euros first prize. Desjoyeaux first won the sailing classic in 2001 and emerged victorious again after an incident-packed race which saw two French competitors dramatically rescued. As Desjoyeaux took line honors on board Foncia, his Open 60 yacht, only 12 of the original 30-strong fleet were still racing. The French have so far dominated the race, which is run every four years, winning all five previous competitions. Skippers are tested to the limit, sleeping only in snatches of 20 minutes as they first battle the Atlantic, then the iceberg strewn Southern Ocean, round Cape Horn and struggle back through the Atlantic to the finish at Les Sables. Desjoyeaux's victory was all the more meritorious after a fault with his yacht meant he was delayed for 40 hours at the start. But he took quickly took command and has left second-placed competitor Roland Jourdain on board Veolia Environnement over 1400 nautical miles behind. In his previous win, he relegated famous British yachtswoman Ellen McArthur into second place, over a day behind.